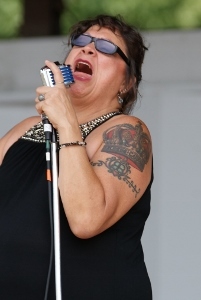 It’s been a few years now since we’ve had a chance to talk about smoky-voiced Pittsburgh native Barbara Blue, who has been holding down a five-nights-a-week gig at Silky O’Sullivan’s on Memphis’ Beale Street for the past 21 years, a feat that long ago earned her the title of “The Reigning Queen of Beale Street”. 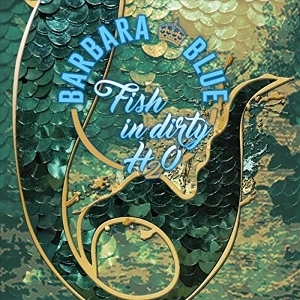 Having previously recorded albums with both Taj Mahal’s Phantom Blues Band and Willie “Pops” Mitchell’s house band, Blue is still giving us plenty to talk about with her 11th independent release Fish in Dirty H2O (Big Blue Records), which may just be one of Barbara’s finest albums yet. Everything here is solid, although we probably would have appreciated more of a straight-up blues take on the title track, a cover of a Koko Taylor tune on which Blue is joined by rapper Al Kapone. While we have to give Blue props for taking such a creative approach to the song, and it certainly works, there’s a part of us that really would have loved to hear Blue belting this one out just as Koko did (and as Blue herself does on other tracks like the tough driving rocker “Accidental Theft” that features former Gregg Allman Band guitarist Scott Sharrard and a New Orleansy “Wild Women” with horns, piano and female backing vocals), especially with so much of the project tending toward the swaying side. That said, if you’re looking for a reason to pick up this album, you need venture no further than the somewhat haunting opening track “My Heart Belongs to the Blues” with its sparing, Buddy Guy-like guitar. But you’re definitely going to want to continue listening to hear such other gems as the gospel R&B soul of “Dr Jesus” — one of two songs here co-written by famed Muscle Shoals organist and songwriter Spooner Oldham, the other being the delightfully slow-burning “Slow Burn” — with such lyrics as “let me tell you about a doctor, no degrees on his wall/ he’s in the healing business, and he’s always on call”; an easy, inviting cover of fellow Memphis bluesman Eric Hughes’ “Meet Me in Memphis” that Blue takes to a deeper level of soul than the original and that the city’s visitors bureau could easily use as part of an advertising campaign, with its flowing keys and horns and lyrics like “meet me in Memphis, where the blues is always hip”, “high time you visit, for a day or two/ you know you miss me, and the barbecue”, “it’s paradise, it’s true, what’s missin’ here is you”, and “standin’ by the river side, watchin’ the sun set/ if there’s a better town, I ain’t been there yet”; a swinging “Gravy Train” that you’re bound to just sop up; and a sturdy, closing cover of Robert Johnson’s “Come On in My Kitchen”. Also worth mentioning of those swaying numbers are a country-flavored adaptation of Sharrard’s “Angeline”, which Blue turns into “Johnny Lee” in honor of Phantom Blues Band/Bonnie Raitt guitarist Johnny Lee Schell, who plays on the track, and the quiet creeping ballad “Walk Away”. Whether she’s digging in deep on a blues or soul tune or tenderly delivering something more of an R&B or Americana variety, there’s no question that Blue puts her whole heart into each of the songs on the album. We could say something clever here about Fish in Dirty H2O helping to demonstrate just how big a fish Blue (who has been honored with memorabilia cases in both the Memphis and Pittsburgh locations of the Hard Rock Cafe, as well as with a brass note on Beale Street’s Walk of Fame) has become in the blues world or how great it is to see this Steel City native’s career progressing so swimmingly, but instead we’ll just leave it at: this is one you’re going to want to dive right back into each time you fin-ish! This entry was posted in Albums and tagged Barbara Blue, Johnny Lee Schell, Scott Sharrard. Bookmark the permalink.